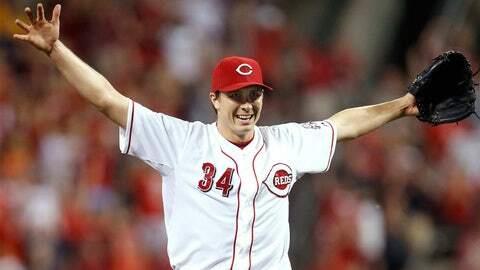 Cincinnati's Homer Bailey celebrates after tossing a no-hitter against the San Francisco Giants in a 3-0 home win at Great American Ball Park on July 2, 2013. It's the first no-hitter of the major league season and the second in Bailey's career. He no-hit the Pirates less than 10 months ago, on Sept. 28 in Pittsburgh, but he was able to enjoy this one at the Reds' home ballpark. Homer Bailey has been a Red since 2007, but there has been speculation this offseason about how long that would remain to be the case. He can become a free agent after the 2014 season, and there were reports the team was open to trading him during the winter meetings in December, perhaps because in anticipation of his signing with another club when he is able. The 27-year-old right-handed pitcher told Fox Sports’ Ken Rosenthal on Friday there is no truth to the suggestion he wants out of Cincinnati, however, and Reds GM Walt Jocketty confirmed the club is still trying to sign Bailey. "We’ll continue to negotiate into spring training and hopefully get something done by the start of the season," Jocketty said. As for Bailey, the owner of two major league no-hitters said his priorities include making a decision that makes sense from a business persecutive while also assuring the team remains "highly competitive" and "plays the game the right way." "I have nothing but good things to say about ownership and management, and I hold a great relationship with the coaching staff," he told Rosenthal.